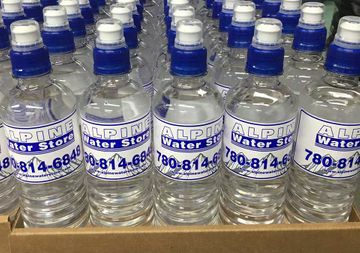 Locally owned and operated since 2002, Alpine Water Store is a family-run business dedicated to providing pure, clean drinking water in Grande Prairie and surrounding areas. Our water is purified on-site through a 14-stage commercial reverse osmosis process and can be purchased at our store or delivered directly to your home or business. 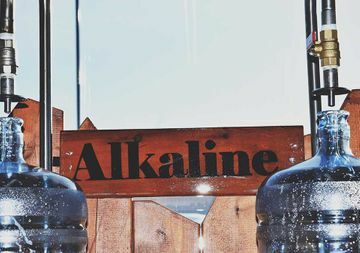 We also offer alkaline water, which can assist in restoring the human body to a healthy pH balance, while neutralizing acidity, maintaining strong bones, and promoting healthy weight loss. We look forward to providing you with the purest drinking water available in an assortment of 3-gallon, 5-gallon, and 500ml bottles. Self-serve taps, bottle sanitizing stations, pre-filled bottles off the shelf, and a 24-hour refilling vending machine are available at our store, along with a variety of coolers, crocks, manual or battery-operated pumps for your bottles, and other water accessories. As a matter of fact, we’re the only water store in Grande Prairie that has eight self-serve water stations that our customers are able to visit and fill any type of container they like with our water, including all competitors’ bottles as well. However, we also bottle and sell 500ml water bottles for your convenience. Customers can purchase cases of 30 bottles in-store, and we can also order in specialized reverse osmosis units for in-home or commercial use. We’ve also added the option to customize your bottles with a company logo. 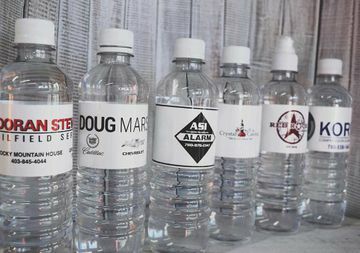 This can be a great way to advertise your business when out on sales calls, when giving away promotions at trade shows and/or golf tournaments, or even when directly selling custom bottles in your place of business. We can even include personal pictures on the bottles for special events, such as graduations, weddings, and/or family reunions. This is a unique and innovative way for businesses, schools, sport teams, and/or any special event coordinators to advertise. We also now offer digital video advertising with a large digital screen from our prominent highway location! Alpine Water Store recently moved to a new location. You can now find us conveniently located in the Centre West Plaza right beside the westside Tim Horton’s in Grande Prairie. To request an estimate for our many services, including water delivery, please feel free to contact us today via phone at 780-814-6848 or email. We look forward to doing business with you and continuing to look out for our community!